Clarence House is the official London residence of the Prince of Wales. Located not far from Buckingham Palace along the Mall, the house is open to the public for part of the summer. Clarence House has always been a royal residence. The impetus for building the house was the marriage of the Duke of Clarence in 1818. The duke was the third son of King George III and had spent most of his life in the Royal Navy including serving with Lord Nelson. For many years, he had lived happily in apartments in St. James Palace with his mistress the actress Dorthy Jordan, by whom he had ten children. However, in 1817, the only legitimate child of his brother King George IV died while delivering a stillborn baby. This put the Duke next in line for the throne and so the Duke had to have a respectable marriage and a respectable London home. The new house was to be built next to St. James Palace. While architect John Nash overran the estimates for building the house, it was a much more modest project than the work Nash was doing for the King in remodeling nearby Buckingham Palace or the work he was doing for another of the Duke's brothers at adjacent Lancaster House. Unlike his brothers, the Duke had simple tastes preferring mahogany to gilt and not much interested in art. Indeed, when the Duke became King William IV, he elected to continue to live in Clarence House. The only change that he had made was the construction of a corridor that linked Clarence House to St. James Palace. The next resident of Clarence House was Victoria, Duchess of Kent, the mother of Queen Victoria. The Duchess tried to dominate her daughter throughout her childhood. For example, the young Victoria was required to sleep in the same room as her mother even as a teenager. The Duchess expected this to continue when William IV died and her daughter became Queen. However, when Victoria ascended to the throne in 1837, she very much wanted her independence. The Queen moved into Buckingham Palace and the Duchess was given Clarence House. During the Duchess' tenure, several changes were made to the house. More gilt work and decoration were added in order to enliven the house. In addition, an entrance was added on the south side of the house. It subsequently became the main entrance. The next two residents of Clarence House were sons of Queen Victoria. Alfred Duke of Edinburgh lived in the house from 1866 until 1893, when he succeeded his paternal uncle as ruler of Saxe-Coburg in Germany. In 1900, Arthur Duke of Connaught was given Clarence House and used it as his London home until 1942. During the remainder of World War II, Clarence House was used by the British Red Cross and the Order of St. John of Jerusalem. It remained unoccupied for several years after the war. Following a refurbishment of the house, Princess Elizabeth and Philip, Duke of Edinburgh, moved into Clarence House with Prince Charles. Princess Anne was born at Clarence House in 1950 The young family moved into Buckingham Palace when Princess Elizabeth became Queen Elizabeth II in 1952. Shortly thereafter, Queen Elizabeth, the Queen Mother, took up residence at Clarence House. She would become Clarence House's longest resident, living there from 1953 until her death in 2002. In many respects, the house is still closely associated with her. 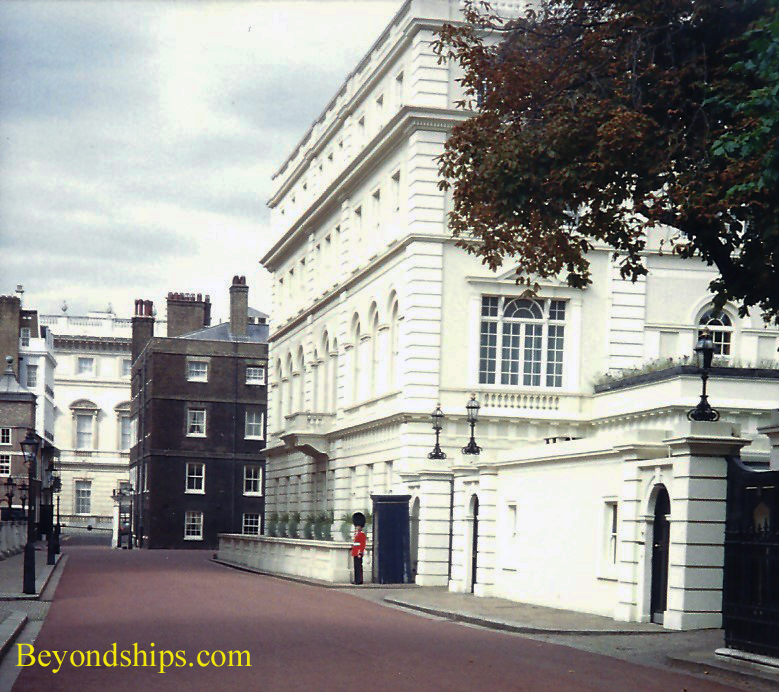 In 2003, Clarence House became the official London residence of the Prince of Wales. It is used in connection with his official duties and with activities relating to the charities that Prince Charles, the Duchess of Cornwall and Prince Harry support. The Ground Floor rooms are used to receive and entertain more than 1,000 guests each year. The upper floors are private living quarters. 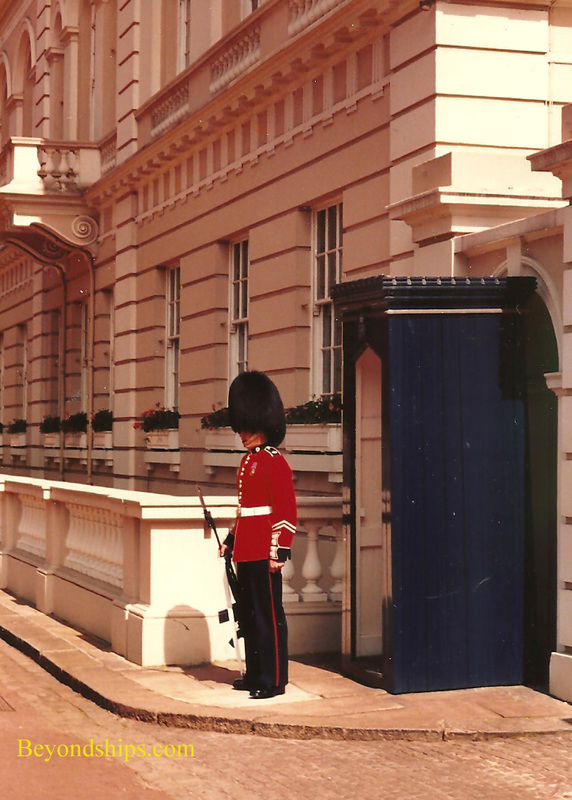 Above: A soldier of the Coldstream Guards on duty outside of Clarence House. Although Clarence House is in the heart of London, it does offer some seclusion. A high brick wall separates the garden from the Mall. Not only does this provide visual separation but it muffles the noise of the traffic and the tourists, although you can hear the horses' hooves as the Household Cavalry passes by on their way to Whitehall. The garden is nowhere near as large as the gardens at Buckingham Palace but there is a fair amount of green lawn broken by some tall trees. This area is shared with St. James Palace. Near the entrance to Clarence house is a formal garden, designed by the Prince of Wales as a memorial to the Queen Mother. You enter the house through a Doric portico. It was added to the house in 1878 when the south entrance became the main entrance. Inside, there is a long hallway with most of the half dozen principal rooms laid out on either side. Most of the rooms have pale pastel colored walls with white trim and ceilings. The contents of the various rooms are a mix of styles. They include portraits and other paintings as well as priceless antiques. In addition to the inherent interest of the works that furnish the room is the reflection of the tastes and thinking of the occupants of the house. Much of the collection is arranged the way it was when the Queen Mother lived in the house and so you get a glimpse of her personality and interests. There are also items selected by the Prince of Wales and so you see things that he has decided to live with in close proximity. And because it is the Royal Family, there are works that were created for them and which have a story attached. Clarence House is open to the public during the summer. Tickets can be purchased online through Royal Palaces. For security reasons, the gate that separates Stable Yard Road from the Mall is kept closed and is guarded by armed soldiers. The visitor entrance is through a gate on the north side of the Mall perhaps 50 yards further along in the direction of Trafalgar Square. 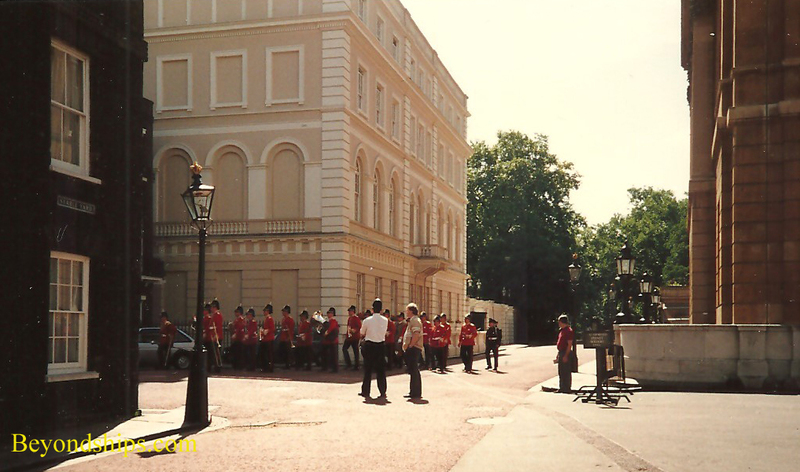 An army band outside of Clarence House.